Bright-eyed and wide-angled, the Nikon F-mount ZEISS Otus 28mm f/1.4 ZF.2 is an optically-refined prime poised to deliver a high degree of resolution and clarity in nearly any shooting condition. Featuring an apochromatic design, and utilizing the Distagon concept to reduce distortion, this lens uses a series of eight anomalous partial dispersion glass elements and two aspherical elements to virtually eliminate chromatic and spherical aberrations throughout the aperture range. A floating elements system is also used for consistent performance throughout the focusing range and a ZEISS T* anti-reflective coating suppresses lens flare and ghosting for increased contrast and color fidelity. 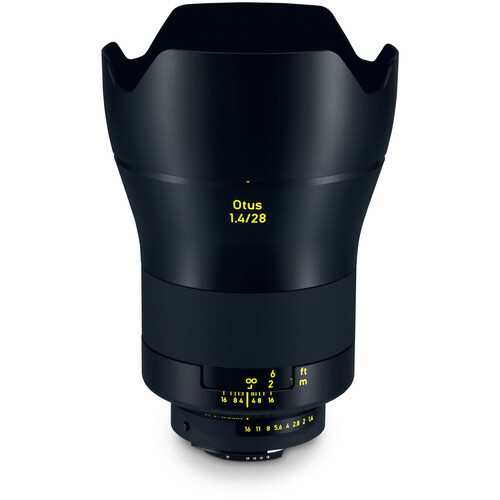 Equaling the optical prowess of a Strigidae-inspired lens, the Otus 28mm f/1.4 is also characterized by a robust physical design for intuitive, exacting handling. The wide-angle focal length pairs with the bright f/1.4 maximum aperture to suit working in broad variety of lighting conditions and is well-suited to a range of applications, including landscape, architecture, and interior photography. Accentuating the range of control, this manual focus lens is complemented by haptic design elements, including a rubberized focus ring and an all-metal lens barrel with high-visibility yellow scale markings. Wide-angle prime is designed for FX-format Nikon F-mount cameras, however can also be used with DX models where it provides a 42mm equivalent focal length. Apochromatic optical design utilizes eight anomalous partial dispersion elements to significantly reduce color fringing and chromatic aberrations for increased clarity and color fidelity. Two aspherical elements control distortion and spherical aberrations in order to produce greater sharpness and more accurate rendering. Floating elements system helps to maintain consistent image quality throughout the entire focusing range, from 11.8" to infinity. Manual focus design is benefitted by focusing and depth of field scales, which are filled with a high-visibility yellow paint, along with hard stops at both infinity and minimum focusing positions. Box Dimensions (LxWxH) 11.4 x 6.7 x 5.7"
Otus 28mm f/1.4 ZF.2 Lens for Nikon F is rated 5.0 out of 5 by 9. Rated 5 out of 5 by jsing from Killer lens for Astrophotography and landscapes This lens is a landscape and astroscape photographers dream lens. Coma at f1.4 very minimal for stars, see my image shot at f1.4 ISO 1600 10sec shutter. Vignettes more than my Otus 55mm but can be corrected, I would reduce half a star for this. Shooting into the sun does not produce flare like my other wide angle lenses but it has very minimal flare. See attached image. With this image I went through the pano in seconds because I don't have to shoot extra images with finger covering the sun for flare. It is heavy, bulky but for now with the results I'm getting I can live with that. If you have money to buy go for it. If you want to try for night photography or landscapes go for it. Rated 5 out of 5 by jsing from Killer lens for Astrophotography and landscapes This lens is a landscape and astroscape photographers dream lens. Coma at f1.4 very minimal for stars, see my image shot at f1.4 ISO 1600 10sec shutter. Vignettes more than my Otus 55mm but can be corrected, I would reduce half a star for this. Shooting into the sun does not produce flare like my other wide angle lenses but it has very minimal flare. See attached image. With this image I went through the pano in seconds because I don't have to shoot extra images with finger covering the sun for flare. It is heavy, bulky but for now with the results I'm getting I can live with that. Go for it as long as you won't go into debt of owning one! Rated 5 out of 5 by Scholz from More useful then I thought As an architectural photographer I am always looking for better wide angle optics. My business is to make client's buildings look great. Prior to purchasing this lens I rented one and shot it side by side with my Nikon 28 1.8, mirror up and electronic front curtain on the D810. The Otus far exceeded the Nikon in every respect. The only time they came even close was at infinity and f8, but even there the edges of the Zeiss were better. What has amazed me however are the many additional subject areas that I find myself shooting with it. I use it all the time when the magazine I shoot for needs a two page spread portrait. The ability to selectively focus a landscape area and let the background go soft is a real plus in terms of creativity. In short I could not be happier with the product. Rated 5 out of 5 by John from I would definitely purchase this again. This will become my go-to landscape lens. It is wide enough for most situations, and can always go portrait and shoot stitched panos. Sharpest lens I have used and has a great color/contrast quality like my Leica lenses. It is a monster however, in size and weight. Glad I recently purchased a truck to drive in to the mountains. This lens is not for backpackers. Rated 5 out of 5 by Greg from What A Lens I got my first Zeiss, the Mulvis 15/2.8 last week. I was extremely impressed with that lens. Although manual focus, it has since kept the Sigma 12-24 and Nikon 16-35 in the bag. And I sent an Irix 15/2.4 Blackstone (a very nice lens actually) back. That initial experience gave me the confidence to order the Otus 28/1.4 and 55/1.4. I have not had full manual lenses since my Canon and Nikon film SLRS and my Mamiya and Rollei MF cameras. TBH, I wasn't sure if my decades-older eyes would be up to the task. Well, I am still not sure about that part, but this lens and the 810A are superb together. P, A, and S modes work flawlessly. I took it out today for a few dozen shots during early afternoon. Light was bright and a bit flat, uninteresting to say the least. But this lens is just extraordinary. Color richness and fidelity, the almost-3D effect of DOF, corner-to-corner sharpness, lack of distortion, resolution, all amazing. I have Sigma 35/1.4 and 24/1.4 Art lenses that I picked up primarily for astrophotography. 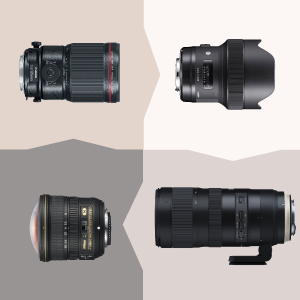 This lens takes their place, as well as the Nikon 24-70/2.8, and every other lens that covers this range. Yes, it's big and heavy; this is not a kit for speed pack ascents. But I will haul these lenses around the world in the next couple of months, because once you have seen what they deliver, there is no going back. Rated 5 out of 5 by mllarson from 2nd Otus, ordered 3rd today This is my 3rd Zeiss, 2nd Otus lens (have the 85mm Otus, 135mm APO Sonnar). I have been converting from my Nikon primes to Zeiss over the past two years because of the color quality, sharpness, and amazing build. I ordered the 28mm Otus yesterday, received it today, and took the attached image a couple hours later. Handheld, absolutely no post production done - NEF to JPEG image from a D4s in the weed patch behind my Minnesota cabin. I am excited to see what this lens can do, given the out of the box quality already seen. Rated 5 out of 5 by Vill from Complete Trinity I got this fat boy to complete the trinity and knew what I was getting myself into. Manual focus and complete picture heaven. I'm extremely happy with the D800e (or D810 for that matter) and the otus combo. Can wait to use this lense on the future 50mp+ sensor to be released by Nikon. Now, for some nit picking: (1) Extremely big, wide girth. 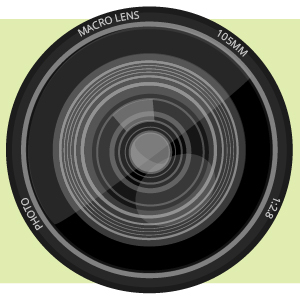 (2) Lense hood is made of slightly thinner metal than its brothers. (3) Be prepared to shell out ($+) for some quality 95mm filters. I 'had' to get the Zeiss UV filter as well as the circular polarizer for mine. The Lee adaptor for the 150mm filter set would be next on the shopping list. (4) Slight barrel distortion (which is easily corrected) but still left me somewhat disappointed in this regard. (5) Not weather sealed (6) Price. Closing comment: I don't know which focal length the otus line will venture into next. Personally I don't think it would be practical to make the otus with an even wider focal length (with the same f-stop), as it'll be physically too big and fat to mount on a camera and carry around on a shoot. is there a tripod collar available to fit this lens? A tripod collar is only necessary with longer/telephoto lenses. Where is the Zeiss Otus 28mm f/1.4 Lens F mount manufactured? The COI for the ZEISS Otus 1.4/38 is Japan. Can you confirm if this model has hard stop focus ring at infinity like other Zeiss models or does the focus ring move past infinity? The Zeiss Otus 1.4/28 focuses beyond infinity, as does the other Otus lenses. The special glass types used in the construction of the lens are sensitive to thermal expansion, so a hard stop would cause infinity problems at high temperatures. What makes it worth a whopping $5K? It's all about precision, and it's not Philosophical. It's expensive because of the cost involved in developing it, the expensive materials and processes, the precision of every part. When you hold it in your hands you already know someone was invested into making this piece ... when you see your first image you wonder how you got such a good deal !!! The Zeiss Otus is the best lens you can buy without selling your house (you might need a loan though ;-). The Nikon F version rotates the same way as Nikon lenses (i.e. the scale reads from infinity on the left to MFD on the right) and the Canon EF version rotates the same way as Canon lenses (i.e. the scale reads from MFD on the left to infinity on the right). Answered by: Frank Shuang C.
Is the depth of field scale on the lens accurate? If for any F Stop, one end of the scale is on Infinity, will the other end of the scale accurately reflect the near focus point? I like the Batis lenses for this reason.